The Intellec Microcomputer Development Systems (MDS) were complete computers intended for the development of Intel microcomputer based products. They included a main unit with CPU, RAM, ROM, I/O and interrupt circuitry, as well as all necessary software: Assembler, linker, debugger. Optional EPROM programmer and In-Circuit Emulator (ICE) allowed real-time emulation and diagnostics into user configured system before saving final program into an EPROM. This helped but it didn't really cut down that much on development time. Loading the assembler took *only* about 30 minutes. While for the program I was working on took almost an hour for each pass and the assembler was three passes (generate symbol table, punch machine code onto teletype paper tape punch, print assembler listing on teletype). The same year, Intel also lauched the Intellec 8 for the 8008, first Intel 8-bit processor. The Intellec MDS was launched in (about) 1975. It featured an 8080 processor and could implement MCS-80 (8080) based computers and Intel Series 3000 systems. The main unit needed a Serial video terminal or an ASR-33 Teletype to be connected, as well as a paper tape puncher/reader and/or floppy drive unit. Siemens sold in Germany a local version of the first Intellec called SME-800. The Intellec series II Model 230 included a 2000 character CRT, a detachable full ASCII keyboard and dual double-density 8" diskette drives providing over 1 MB of data storage. ISIS-II Diskette Operating Software allowed the Model 230 to be used for assembly and/or compilation and debugging of programs for Intel's MSC-80 (8080), MCS-85 (8085) or MCS-48 (8048) microprocessor families. ISIS also supported FORTRAN and PL/M languages. As Intel's customers upgraded their designs from the 8085 to the 8086, Intel upgraded its 'Intellec' development system from Series-2 to Series-3 by plugging in a new 16 bit board called "RPA-86" (Resident Processor Assembly) with 8086 CPU and 16 bit wide RAM and ROM. The Series-3 boots up in 8 bit mode with the 8085 running under ISIS-2 like before, but when 16 bit software has to be executed, then the 8085 hands over the control to this new board which becomes bus master, and the rest of the Intellec MDS just serves as an I/O subsystem. Thanks to Gottfried Silberhorn for information and pictures. The 4040, an improved successor to the 4004, was also introduced in 1974. 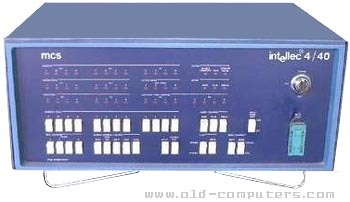 The Intellec 4/Mod 40 (Intellec 4/40), which was 4040-based, was probably introduced around this time. I would assume that Intel renamed the Intellec 4 to the Intellec 4/Mod 4, just as they had done to the Intellec 8.
see more Intel Intellec Series Ebay auctions !